I like Foster The People. A great band who paid their dues for years in struggling until their breakout hit “Pumped Up Kicks” took them from the gutter to the penthouse. 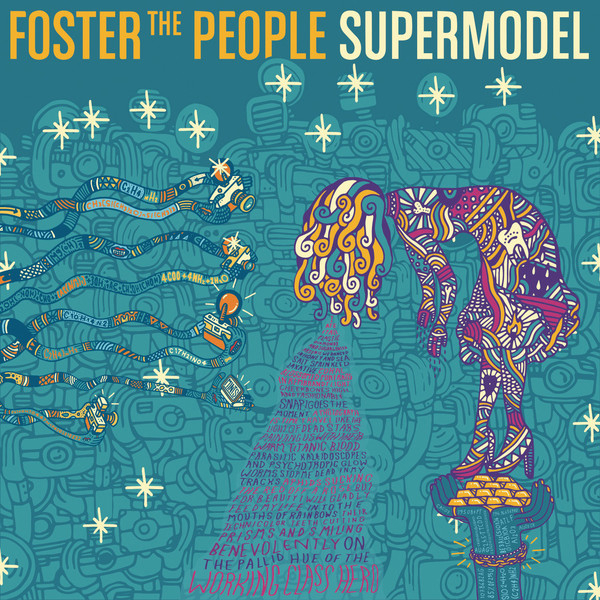 In their second album, “Supermodel”, they create something different. A bit dark in many areas, there’s eleven new songs to entice you to remain a fan of their music. After a good ten or so listens to the entire album, I can tell you that it’s nothing like their debut album “Torches” which was not only a great album, but my top pick in my best of list of music for 2011. What this album is would be more of an experimental set of songs that delve into the personal life of leader Mark Foster. “Coming of Age” is about as close as we get to something that sounds like the first album. “Pseudologia Fantastica” is easily associated with the sound of Tame Impala and MGMT. “Are You What You Want to Be?” is pretty great as an album opening track. “Fire Escape” is a personal metaphor and probably the weakest song on the album, in my opinion. I like “Best Friend” which is the current single. It’s catchy and shows that Mark Foster can write a poppy song. There’s not clones of “Pumped Up Kicks” here on these 11 songs. Nope. But I don’t think that’s what they wanted to do. Lots of bands try hard in not wanting to make a clone of their last hit album, regardless of what the head honchos at the record labels hope for. Mark’s mantra in creating this album was a “conversation with God” which sounds a bit close to Brian Wilson’s mantra in creating the Beach Boys masterpiece “Pet Sounds” Well, not to set Mark Foster back any on his quest, this is no “Pet Sounds” Will it ever become a landmark album? I don’t think so, even though I really like this band and some of these songs have grown on me with repeated listens. If you can get past your love of “Torches” and find some new favorite tracks here, “Supermodel” is a decent record and one that will hold you over until they record their third release. You don’t sound particularly infatuated with it. Unfortunately, I’m not. It’s good, but I was hoping for it to be better. I don’t think I’ve listened to any of their stuff yet.